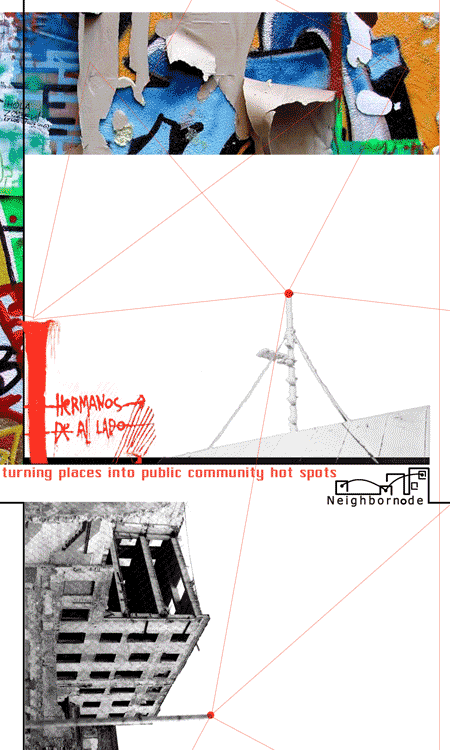 Neighbornode is a project that merges the location-specific nature of the neighborhood with the universal, networked nature of the web, allowing strangers who live on the same street to post messages to each other and engage in dialogue via a web bulletin board. Residents access these common web spaces via an open wireless node placed on their street that directs them to the boards. Neighbornode is part of a bare-bones software package provided by NYCWireless, a volunteer advocacy group instrumental in turning places into public hot spots. The group is encouraging people to set up their own hot spots and electronic bulletin boards to let communities of otherwise anonymous urbanites find one another. The NYCwireless Community Hotspot Kit allows to create a Community Hotspot anywhere, with only an old PC and a few extra items. Configuring the kit is easy and takes only a few minutes. Once configured, people can instantly run Neighbornode and Wi-Fi Thank You (a site where you can post a thank you to anyone who provides a free Wi-Fi access point), which come with the kit, or can create an entirely new Comunity Hotspot application of they own. Many people choose to leave their wifi access open, allowing others in the vicinity free access to the Internet. These are known as open access points. What turns these ordinary wifi access points into Community Hotspots is when the owner takes the additional step of configuring software on the access point that allows everyone who logs on to interact with each other in some way. With this extra step, access points that were formerly an anonymous experience for users become flashpoints for communication and exchange between people in a local area. The result is an online space where communities can grow and flourish. Dana Spiegel and John Geraci leads Community Hotspot Project. Neighbornode is an example of Community Hotspot applications created by Geraci. Dana Spiegel work on "creating visualizations of social groups online and...creating richly visual and intuitive online and augmented real-world social spaces; " she was one of producers of Spectropolis, the mobile media and art event. >from *Neighbornodes* and related web sites.